Run a search or open a collection, then select Available now from the "Availability" filter on the results page. Use the "Availability" drop-down in the advanced search to search for titles that are available now. Run a search or open a collection, then select Available Now from the "Show me" filter on the results page. 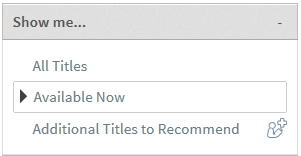 Select Available Now in the advanced search to search for titles that are available now.